This 12/2 NM-B Cable is used for both exposed and concealed work. The cable features 2 annealed copper conductors and is primarily used in residential wiring as branch circuits for outlets, switches and other loads. 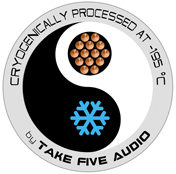 See for yourself the difference that our Deep Cryo Treated Romex makes in your dedicated audio circuit. Unlike vapour processing our process ensures that the temperature of the wire in the core of the spool reaches -195 C and that it is held there for an absolute minimum of 26 hours.